‘We cannot deny that at this moment we don’t have a striker who scores 20 goals in the season.’ These were the words uttered by Louis van Gaal prior to the match against Sunderland at Old Trafford. Well, the truth is he does have that striker right under his nose, Wayne Rooney, who proved yet again that his best position in the side is up front where his goal scoring talents belong. His performance against Sunderland should be enough for the manager to keep him there. However, with van Gaal you never know. After the disappointment of last weeks defeat in Wales, it was back to Old Trafford and the visit of the Black Cats from the North East. Now we enter into the last 12 matches of the Premier League so it was critical to start on another unbeaten run of matches. There had been some bad and good news on the injury front during the build up to the match with Robin van Persie’s ankle injury expected to keep him out for the next few weeks but on the positive side Michael Carrick was training again and was to be included in the squad. 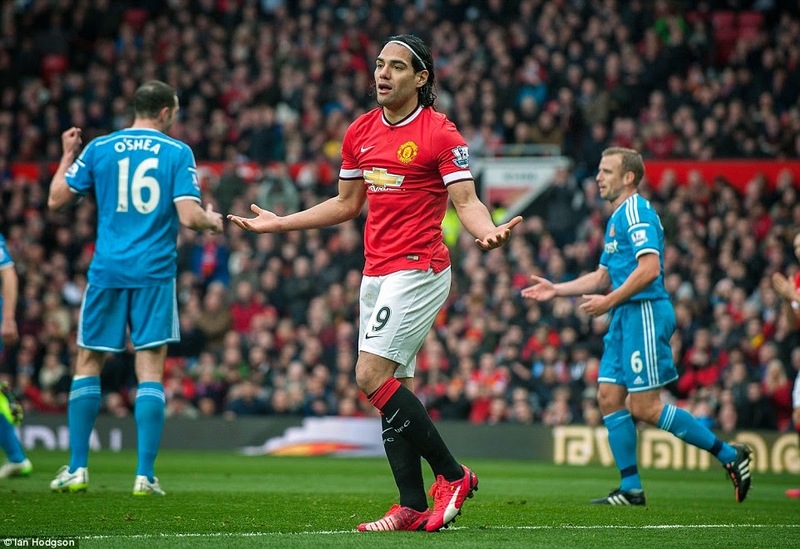 Louis van Gaal’s main headache with the team selection was who he would use in the attack as many fans were calling for a Rooney and Wilson strikeforce with others in the Rooney and Falcao corner. In the end, the manager went for the latter. 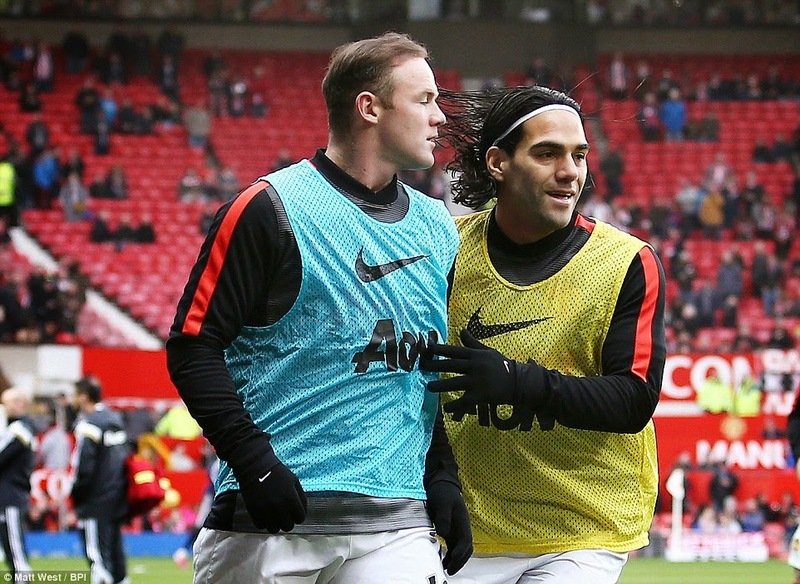 United’s starting eleven: De Gea, Valencia, Smalling, Evans, Rojo, Blind, Herrera, Young, Di Maria, Rooney and Falcao. Subs: Lindegaard, McNair, Carrick, Fellaini, Mata, Januzaj and Wilson. This side meant five changes for United, with Valencia, Smalling, Evans, Young & Falcao all returning to the side and Fellaini dropped to the bench. Ander Herrera was most definitely back in the good books as he started yet again but there was not such good news for Juan Mata who has now not started a league game for six weeks, when he was hauled off at half-time against QPR. 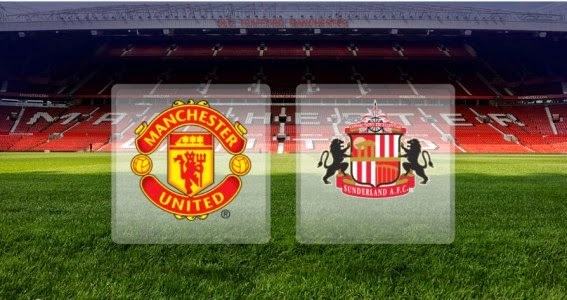 United started the match attacking the Scoreboard End and facing two former reds in the Sunderland defence Wes Brown and John O’Shea. Ashley Young started brightly down the left trying his luck with a few early crosses which resulted in a couple of corners the last of which taken by Di Maria was met by Rooney with his head but lacked both power and accuracy. On 5 minutes Sunderland broke through the middle with Wickham who was allowed without challenge to take the ball a long way into United’s half and let fly with a shot that David de Gea thankfully pushed away for a corner. Shortly afterwards, Rooney gave the ball away deep in his own half and Defoe pounced and tried his luck from distance thankfully it was nowhere near the target. Yet again poor passing and a lack of defensive cohesion in the opening ten minutes made Sunderland look better than they really are and gave them a foothold in the match. In the 12th minute Falcao made a good claim for a penalty after he seemed to be shoved to the ground inside the area but referee Roger East waved play on and as the ball was cleared Young hit a thunderous volley which went wide but deserved better. Rooney and Falcao were simply not on the same wavelength as a couple of touches they attempted to each other came to nothing. At one point in the opening exchanges, Falcao was bustled off the ball from which Defoe was given yet another sight of goal this time he was on target but the impressive de Gea was equal to it. The most infuriating aspect of the game in the early stages was that all the visitors chances originated from United’s mistakes and the errors were really basic in nature. 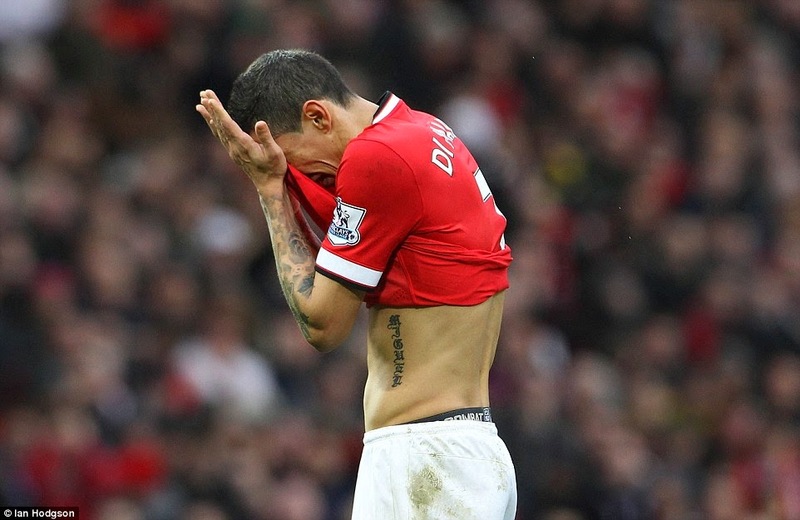 After 19 minutes, it was the turn of Di Maria to misplace a pass straight into the path of the Sunderland attackers which amounted to nothing serious in the end but that’s not the point. It’s worrying having the defence make mistakes without our world class talent joining in. As the game evolved you could see that Wes Brown had Falcao totally in his pocket and was marshaling the Colombian well. At last in the 27th minute a great move down the right started by Di Maria when he played the ball out wide to Antonio Valencia who in turn lashed in a wicked cross which was met at the far post by the impressive Young who let fly with a shot that O’Shea managed to get a touch on and in doing so diverted the ball onto the crossbar and out of danger. Now United started to get going mainly through Di Maria who won a free-kick 30 yards out which he elected to take himself but ended up going too high over the bar. This season United’s set pieces have been really terrible with the record signing being the biggest culprit. Ashley Young was the star of the half and went close with a typical right footed curler in the 34th minute. In the 37th minute, another free-kick and this time Rooney fancied his luck but it was easily turned over for a corner by keeper Pantilimon. 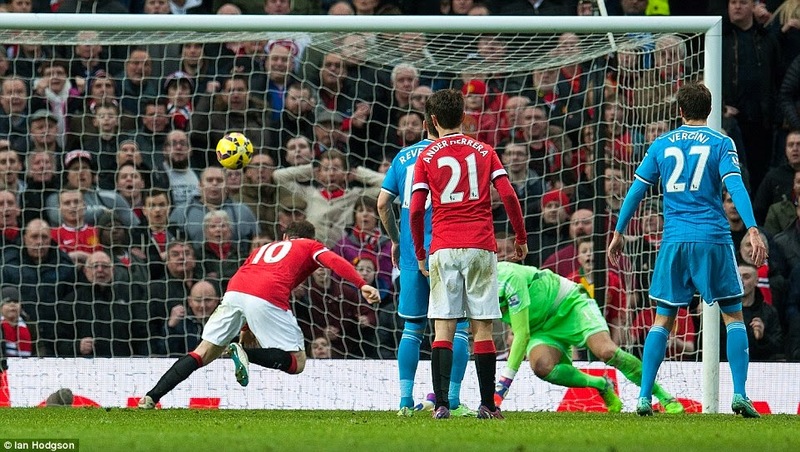 From the resulting corner, Rojo had a snapshot which almost found it’s way through to goal. Five minutes from half-time and again great work from Young as he crossed low into the box to exactly where Falcao should have been but for some reason the Colombian had run backwards away from the play and the hard work of Young was wasted. A break from Di Maria in the dying moments of the half ended with the Argentinian electing to pass to Falcao which was a mistake as he should have picked out Young who was totally unmarked inside the box, yet again a poor selection from Di Maria which has been the story of his play of late. Brown and O’Shea must have been very pleased how the half ended after they had not allowed Rooney and especially Falcao a clear chance on goal proving that experience, not class can win matches. 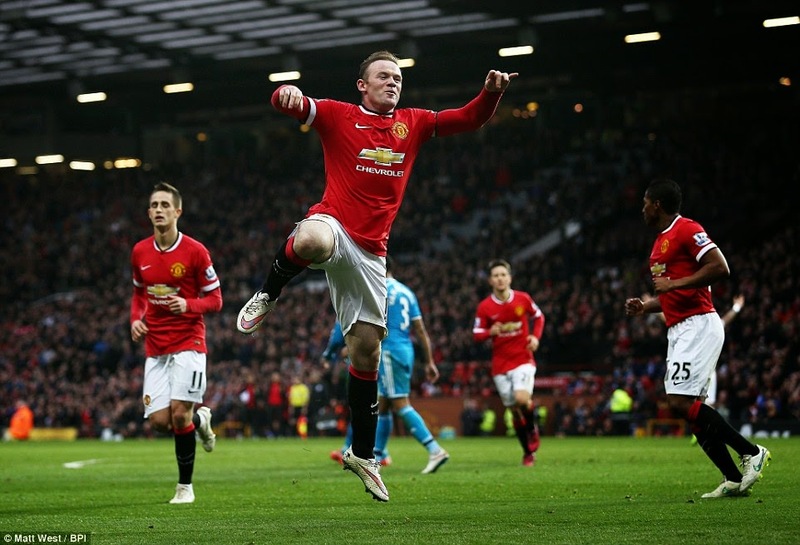 Half time and at 0-0 it had been another disappointing display from United with a lack of imagination in their game. Everything smacked of desperation which led to panic moments which in turn gave the visitors more chances than they could have believed they would have had. Falcao spent most of the first half on his backside after being brushed off the ball far too easily and his positioning play was woeful. The only positive was the performance of Ashley Young who tried to instill some urgency into the attacks and was unlucky not to be on the scoresheet. A quiet crowd as there was really nothing to cheer about even though they did try to rally the team by shouting Attack! Attack! Attack! but that clearly wasn’t heard by the players. Louis van Gaal decided to make a change at the start of the second half by bringing on Adnan Januzaj in place of Angel Di Maria. After under performing in his previous outings, this was a great opportunity for the Belgian to prove his worth. Right from the start Jonny Evans put a stop to a Sunderland break in the first minute by sticking out his foot just at the right time. Blind started a good passing move straight down the middle exchanging one-twos with Herrera and Rooney eventually the move broke down but it showed the quality that Blind has as he quietly goes about his job in midfield. In the 52nd minute there was a move that summed up United’s lack of communication as there was a rare misunderstanding between Young and Rojo as the England international played a ball to the space on his left where he thought his colleague would be running into but Rojo had in fact stopped running completely. After an hour of play van Gaal had seen enough of Falcao and ordered his second Belgian substitute Fellaini to warm up. As he was doing this Valencia won a free kick on the right that Rooney swung over and it was headed clear only to the waiting Januzaj who connected really well but couldn’t keep it on target, better from United. Then in the 63rd minute the complexion of the game changed completely. As Falcao, who was about to be taken off, turned well in the area but was impeded by both Wes Brown and John O’Shea which resulted in a penalty. Afer a comical few minutes Wes Brown was given his marching orders but took a long time to leave the pitch as he argued correctly that it was, in fact, his defensive partner John O’shea who had committed the foul, not him. 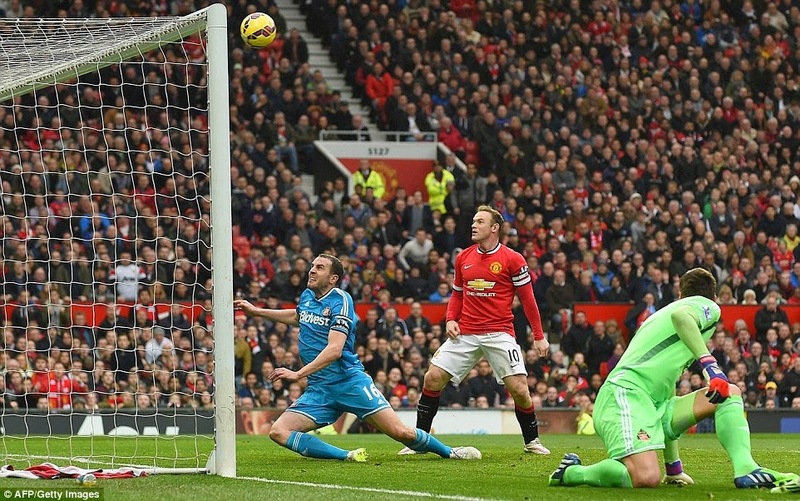 Some two minutes later captain Rooney stepped up and blasted the ball into the bottom corner to make it 1-0. 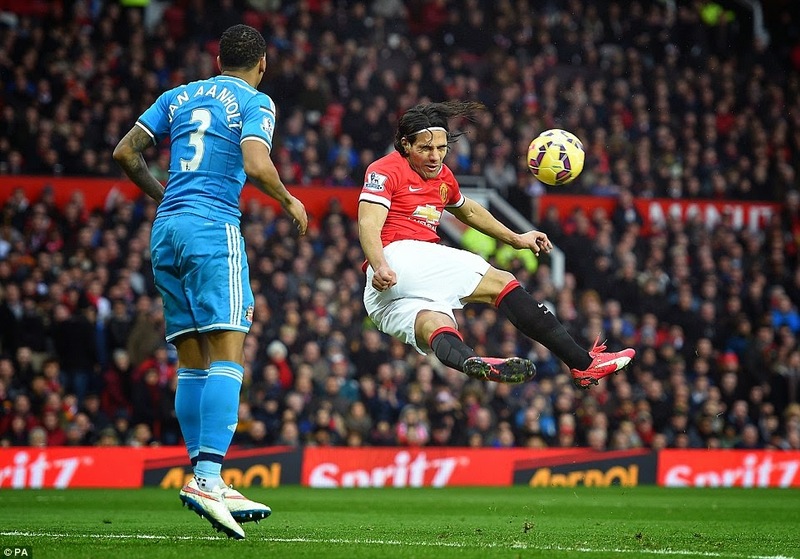 That was the last action Falcao would see as he was hooked off by van Gaal and replaced with Fellaini. Apart from winning the penalty he had done absolutely nothing of worth and I will be surprised if he is not sent back to Monaco at the end of this season unless he starts contributing more to the team. Good old Ashley Young was still running his socks off down the left-hand side and pinging crosses over into the danger area one of which Januzaj was unlucky not to connect with properly. If any player deserved a goal or assist it was Young. Leading 1-0 and playing against ten men United started to play with less panic and more confidence by passing the ball around well and in the 72nd minute it almost opened up for Fellaini but he blasted the ball high and wide. In the following ten minutes, United had corners, free-kicks and crosses to try their luck with but nobody could find the direction to trouble the keeper. 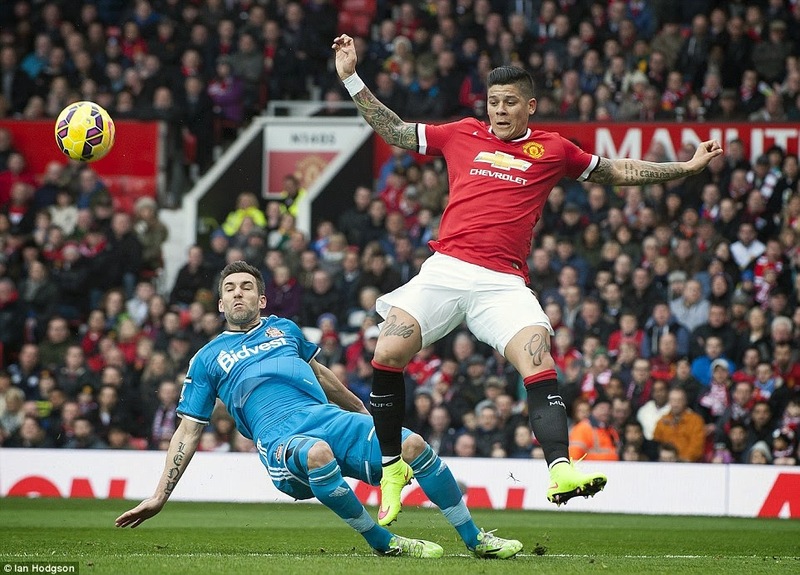 Both Smalling and Rojo tried with their heads but to no avail. On many occasions, Januzaj had the chance to provide telling crosses but selected to shoot from tight angles which clearly infuriated his forwards. He should watch and learn from the likes of Young who had spent all the match trying to set up his teammates rather than chase glory. The second goal came in the 84th minute when Wayne Rooney scored his second by latching on to a rebound off the keeper with his head from close range after one of those shots by Januzaj. 2-0 and no way back for Sunderland. With that in mind van Gaal brought on Mata for goal hero Rooney for the last five minutes with one eye on the Newcastle match in midweek. In the dying seconds, the whole ground thought that Herrera had added a third after Fellaini had missed a great chance but as the ball was put back into the area the Spaniard was just offside. Unlucky for Herrera as that goal would have kept up his good recent scoring record. In the end a win and three very valuable points gained by United who temporarily moved up into third place in the league. This was a match which on paper seemed fairly straight forward but due to the home team’s own mistakes wasn’t. Until the penalty decision it was difficult to see where the goals would come from. The United players seem shackled and lack the ability to express themselves and play with a freedom that would rip opposing teams apart. Maybe when they have the guarantee of Champions League football under their belt they will be released from the tactical responsibilities and finish the season in true style, we can only hope. If man of the match Ashley Young and captain Wayne Rooney can keep fit and continue in this vein for the run in then United have a chance to finish in one of the Champions League places. The brace were Rooney’s first Premier League goals in 2015 and at last he’s back in the position where he is the most dangerous but for how long only the manager knows. Next up is a tricky away trip to St James’ Park to take on Newcastle United on Wednesday evening but with Rooney firing again I fully expect United to grab all three points as he has an impressive record against the Magpies having netted 11 times in 18 matches. Then it’s the return of the FA Cup and a big chance to pile the misery on Arsenal who looked terrible against Monaco in the Champions League. It was very pleasing to see former Red Devil Dimitar Berbatov grab a goal against the Gunners in that match. Previous United lose it at The Liberty. Next Better late than never for United.